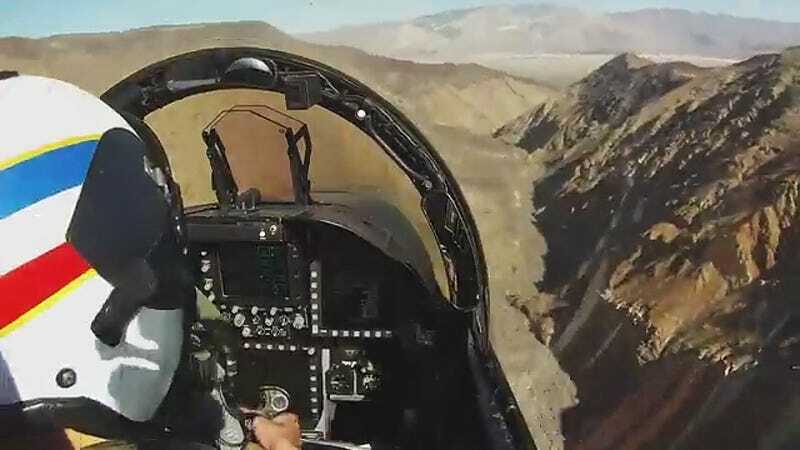 Some of the most incredible military aviation photos taken in recent years have come at a point along the low-level military training route in California known as “Sidewinder” where a deep canyon, reminiscent of those from Star Wars, opens up into a vast dry desert valley. This portion of the route is known lovingly as the “Jedi Transition” which you can read all about here. Although we have seen images from outside of the cockpit as aircraft thunder through this famous crevasse, some of them mind-bending in nature, this video takes us inside the cockpit as a Navy F/A-18F Super Hornet driver muscles their way through the Sidewinder training route and down into the Jedi Transition. Notice the stick inputs needed to point the Super Hornet in the right direction down in the thick atmosphere just above the ground.